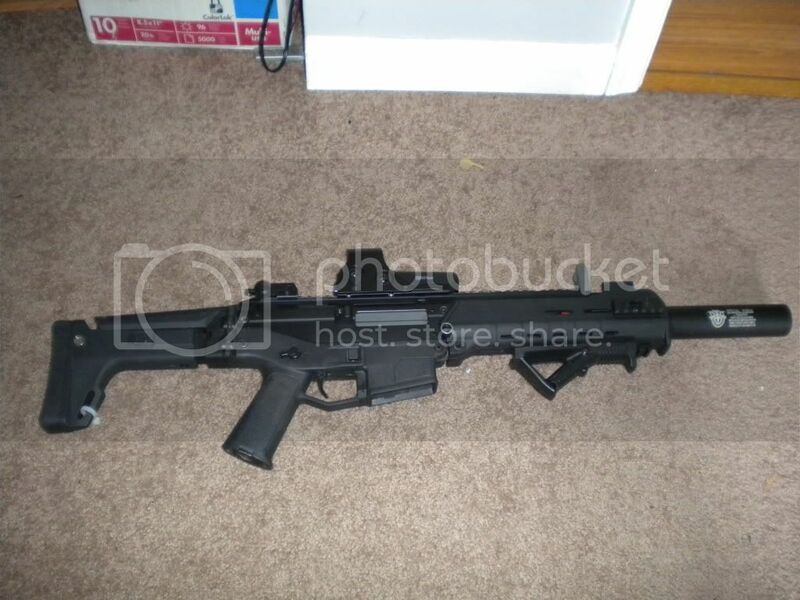 -origonally started as an ECHO 1, now the only stock part left on the gun is the front rail system. -origionally started as an A&K SR25, I gutted everything except for the gearbox and body and built it up from there. Last edited by Teddy Bear; 04-28-2010 at 11:58 AM. Joker, hands down, that has to be one of the sexiest rifles I've seen in the Airsoft world. So simple, yet definitely deserves a +1, good man. Sorry guys. I think mine is the sexiest! Joker you know I sitll love you! shoots like a dream. feels like a beast. and the rest of the family..
What kind of light is that on the SCAR, mrobben? 'standard gear' m900 replica.. with the BIG head. its the old version.. the new version has LED .. this one is just a heat lamp. Well, it looks great, and sure beats the $500 Surefire! and wow.. 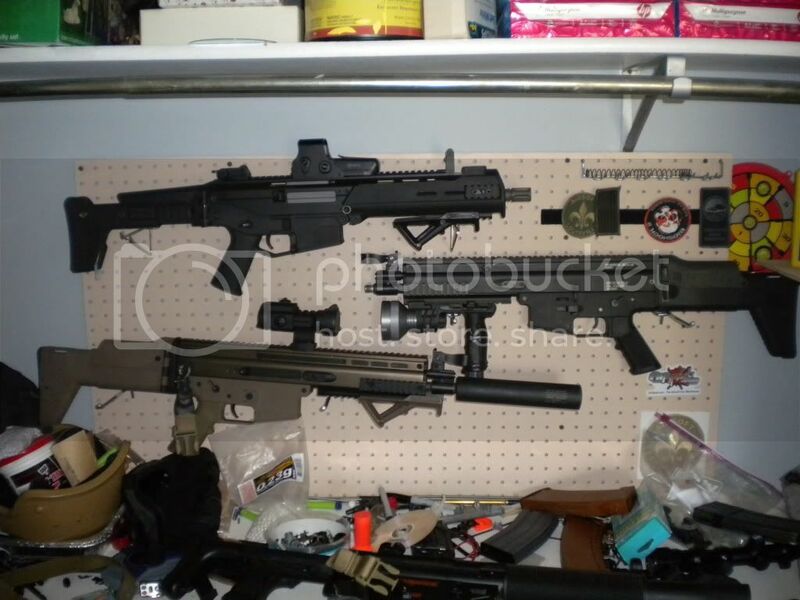 I really need to clean my office.. heh.. never noticed how messy that shelf is..
Wow, that Masada in the most beautiful gun I've ever seen, the AFG looks awesome on it! Last edited by Italian; 05-01-2010 at 04:54 PM. My Echo1(major upgrade plans for the near future) with an SRC suppressor,custom sling professionally sewn by my mother, 5 Star midcaps, 2 MAG midcaps, and 1 stock hi-cap as a backup for CQB games. The M16 in basic black ... as good as, if not better than, any Tactical Girl! "The bitterness of poor quality remains long after the sweetness of a low price is gone." "some say one shot one kill i say as many as it takes"
Nothing on the exterior is stock except the body. Still have to rewire the stock and install a new hop-up. Last edited by A K; 05-05-2010 at 06:12 PM. “Some people wonder all their lives if they've made a difference. Marines don't have that problem." Just finished the paint tonight. I was always afraid to paint any of my guns but the worst thing that can happen is repainting it. The orange on the mags should make it easier to find if I drop one. Who hasn't dropped a mag in the woods?